When you look at leaders like Booker T. Washington, Benjamin Franklin, Mahatma Gandhi, Martin Luther King, Mother Teresa, Mikhail Gorbachev, Dalai Lama and Aung San Sui Kyi, there is a common thread connecting all of them―soft leadership. They are all soft leaders who silently performed and led the people for accomplishing their dreams. They have character, charisma, conscience, conviction, courage, communication, compassion, commitment, consistency, consideration and contributed extensively toward society and made a difference in the lives of others. I have coined a new concept ‘Soft leadership’ to overcome the drawbacks in the existing leadership styles. 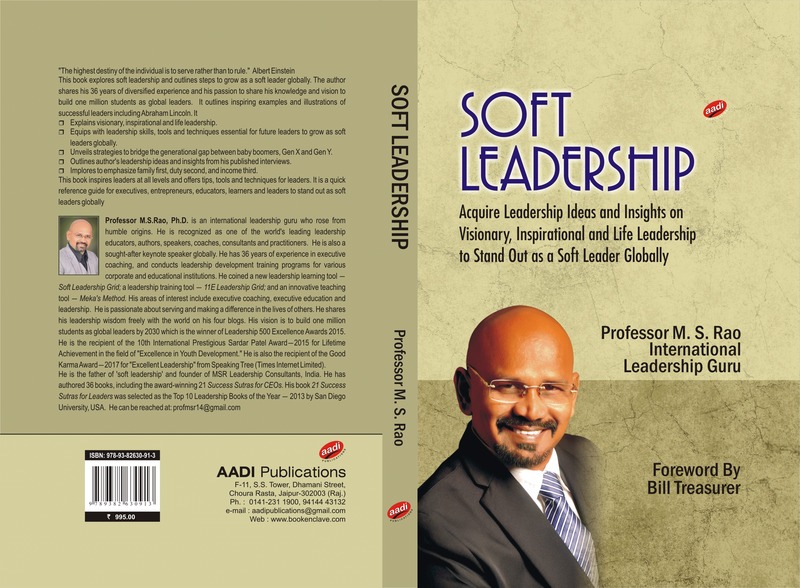 I have authored a book on this concept titled, Soft Leadership: Make Others Feel More Important and published several research papers and articles for international journals and magazines. It is getting overwhelming response globally. One of the award-winning research papers titled, Soft leadership: a new direction to leadership, URL: http://www.emeraldinsight.com/journals.htm?articleid=17087126 is amongst the most frequently downloaded in Industrial and Commercial Training, Emerald UK. Here is the description about soft leadership. Various leadership researchers, experts, educators, writers, consultants, and practitioners in the leadership domain have pioneered specific styles and types of leadership. As a result, we have various styles and types in leadership, thus enriching the leadership domain. Similarly, soft leadership is another new concept to add value to the leadership literature. Soft leadership is leading through soft skills and people skills. It blends soft skills, hard skills and leadership. It emphasizes the significance of precious Human Resources. It helps in managing the emotions, egos, and feelings of the people successfully. It focuses on the personality, attitude, and behavior of the people, and calls for making others feel more important. It is an integrative, participative, relationship, and behavioral leadership model adopting tools such as persuasion, negotiation, recognition, appreciation, motivation, and collaboration to accomplish the tasks effectively. Soft leadership is not a submissive leadership or a lame duck leadership but an assertive leadership where soft leaders adopt pleasing and polite communication to execute the tasks. It is a blend of courageous leadership, thought leadership, servant leadership and inspirational leadership. Leadership basically depends on three aspects—how you communicate with others; how you make decisions; and how you take action. When you can execute these three activities effectively you become a successful leader. However, to evolve as a soft leader, you must communicate with an emphasis on soft skills; make decisions by blending your head, heart and gut; and take action keeping the ground realities and goals in your view without compromising task-orientation. There are 11 Cs that constitute soft leadership. They are: character, charisma, conscience, conviction, courage, communication, compassion, commitment, consistency, consideration and contribution. It is highly challenging for people to cultivate these 11 characteristics. However, if people possess more than 6 traits they get into the fold of soft leadership. Soft leadership helps lead knowledge workers effectively. Previously there were more manual workers who needed various leadership styles. However, in the present rapid changing digital scenario, the knowledge workers need a different leadership style—soft leadership style. The knowledge workers are ambitious, intelligent, and tech savvy. They have totally different expectations and aspirations than their predecessors. They have an advanced mindset, toolset and skillset gained through unique professional experiences. And soft leadership is the ideal fit for their needs. Currently the employees are more diverse than ever, and this offers both opportunities and threats. Opportunities include creativity and innovation to improve products and services; and threats include looking at differences, not similarities. Hence, we must convert this threat into an opportunity by celebrating diversity in the workplace. It also calls for unique leadership style that brings employees into one common platform to achieve the organizational goals and objectives. Globally the philosophy of ‘employees first, customers second, and shareholders third’ is gaining momentum. Keeping this philosophy in view, the global organizations need leaders who can navigate their organizations through a network of relationships. Presently the days of positional power work less and referent power works more. Above all, the global organizations must be networked, flat, flexible and diverse. Hence, soft leadership can work for any company and country regardless of its size or budget. The days of command-and-control leadership don’t work anymore. What works presently is trust-and-track leadership. As the world is changing rapidly, the knowledge, skills and abilities essential for employees are changing rapidly. The employees are reinventing themselves to keep pace with the rapid changes in technologies. Additionally, they are more focused on their careers, and are ready to sacrifice their families to fast-track their careers. Their expectations and aspirations are rising. Hence, leaders at the top must reinvent with their leadership styles, tools and techniques to lead their employees in this digital age. To conclude, exploring soft leadership helps greatly for the leaders to satisfy all stakeholders to achieve organizational excellence and effectiveness.